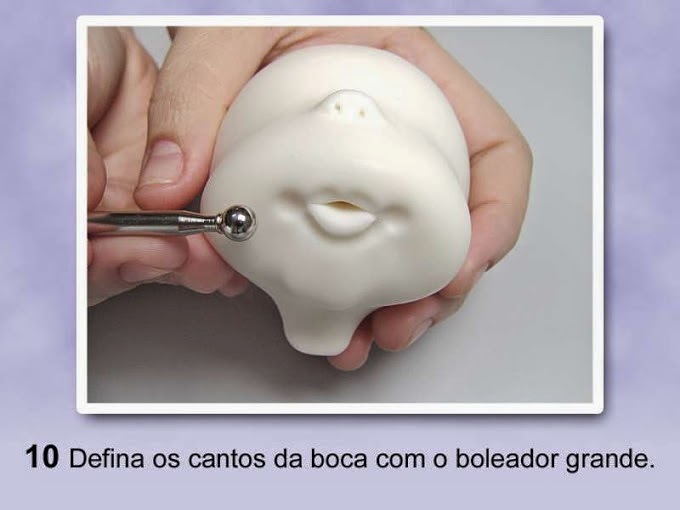 Many cold porcelain figures, dolls and animals, all start by modeling a basic cute head and then adding the eyes, expression, hair, etc to create the character (such as the doll shown above). 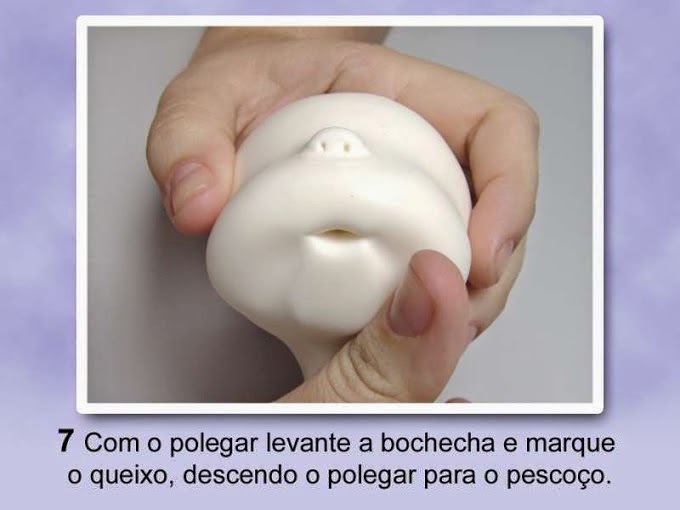 This 'basic cute head' tutorial was originally published in a Portuguese magazine and I have done my best to translate the instructions into English for those that cannot read the Portuguese. .
Materials needed are some cold porcelain paste (or other soft air-dry-clay) and a Styrofoam ball. Tools used are your fingers, a cutting tool, a crochet hook and a ball-end tool. The first step is to tint your clay/cold porcelain a peach tone or other flesh tone unless your prefer tinting or painting after it has cured. 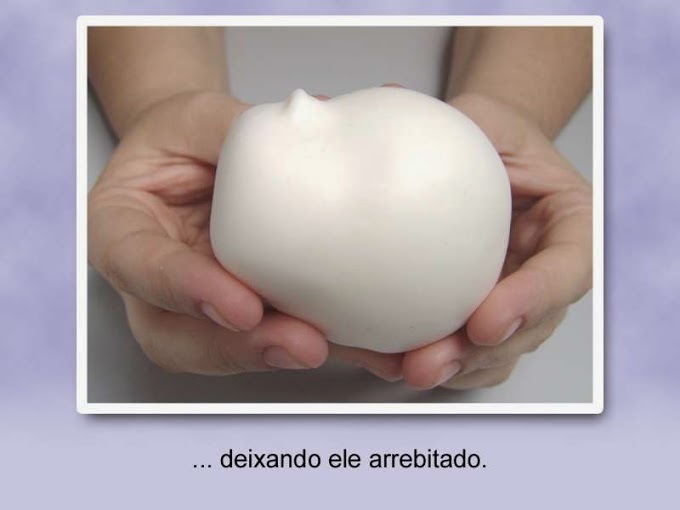 Close any gaps that appear as you wrap the CP so that you completely enclose the foam ball inside. Avoid trapping any air. 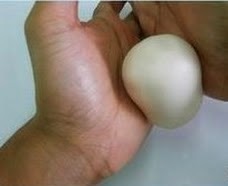 With the palms of your hands, smooth and shape the CP into an egg shape. Using your thumbs, enhance the curvature of the nose and forehead. 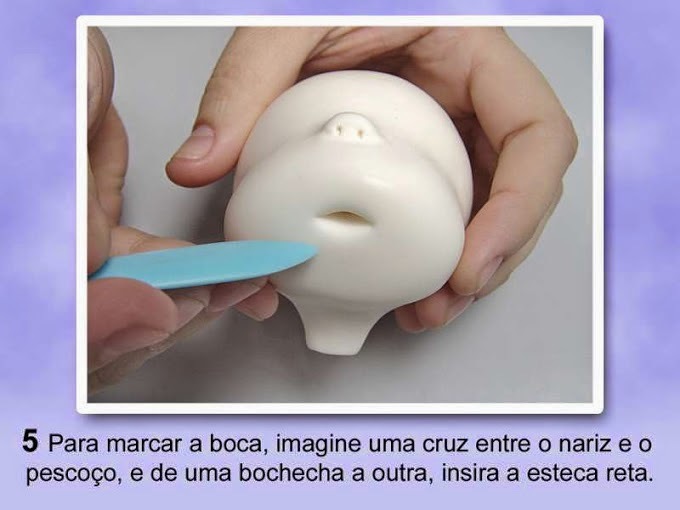 Refine the shape of the head and add a neck. .....leaving a pointed nose shape. 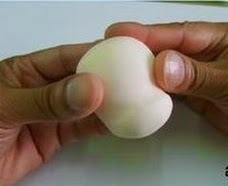 Strengthen the shape around the area of the eye with your thumb. Add nostrils. To mark the mouth, envision an imaginary line that creates a cross between the nose and neck and from one cheek to the other cheek. Where the imaginary line crosses, insert the tool straight in to form a mouth. With the end of a crochet hook, create a diagonal crease in each corner of mouth. Using the diagonal mark as a guide, use your thumb to lift the cheek and indent the chin, smoothing down toward the neck. With the small end of a ball-end tool, shape the lower lip....running tool from one side to another. Shape the upper lip with the same tool, using gentle movements. 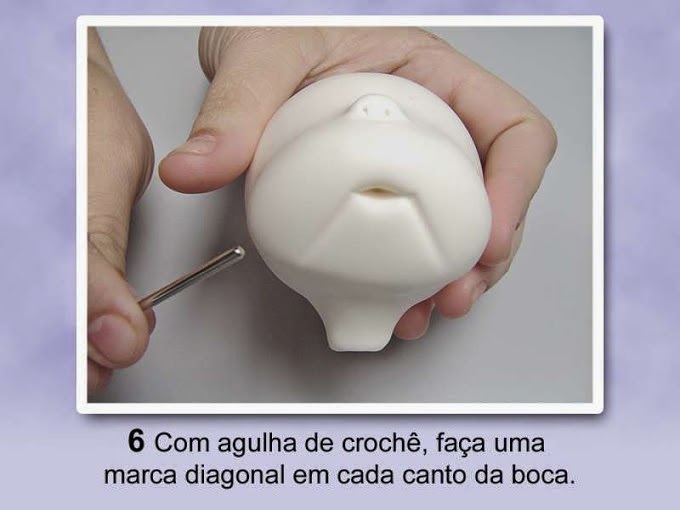 Define the corners of the mouth by dimpling with large end of ball-end tool. With smaller end of ball-end tool, create small mark on top of the upper lip. Ears ... create 2 ears and glue onto the head of the doll. Shape 2 equal amounts of CP into 2 small ovals. Roll between fingers to indent slightly. 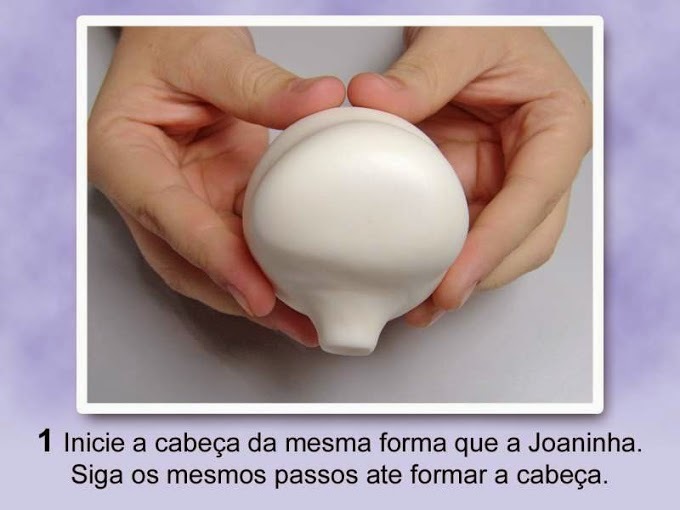 Attach an ear to each side of head using round-end tool to apply pressure to center of ear. After CP has dried and cured, flesh color can be painted (if you didn't pre-tint) and eye decals can be glued on or eyes painted on. 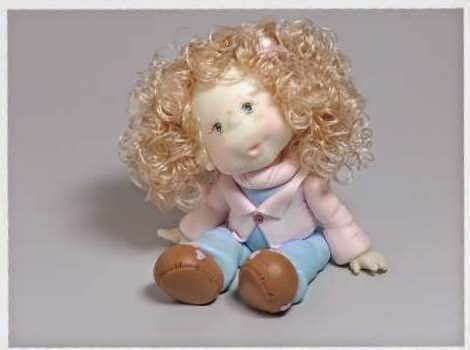 Hair can be molded from additional CP paste or various types of doll hair material can be glued on. Lots of different characters can be made by varying the embellishments. The boy doll and girl doll shown below both started with this basic "cute" head. The boy's hair is molded clay, but the girl has purchased doll hair glued on. 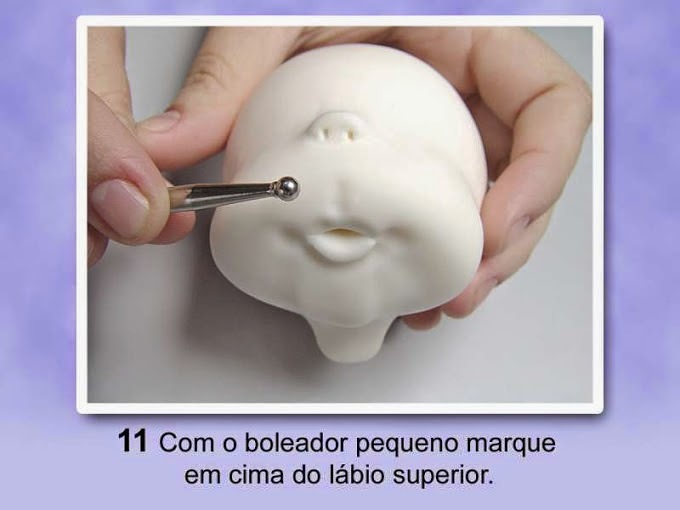 The head for the little kitty was modeled in a similar way as basic doll's head. un paso a paso estupendo,me encantaría poder llegar hacer una muñequita la mitad de guapa que esta.Un saludo. Hi Susie, That's a hard question to answer in just a few sentences. Most often it's caused by uneven drying. Did you use an armature so that the thickness of the CP is pretty even? Did you try to speed up drying so that exterior dried before interior? Next time try building up a figure in layers, letting each layer dry as you go before adding more CP. Another reason could be too dry CP paste. In any case it can be fixed by making a slurry or slip (watered down CP) and filling in to repair the cracks. Also make sure there are no small cracks in the cp before making, they will spread out & be more obvious. Love this & it was really helpful. In the past I have only used a very simple mouth. I still can not make this one look good but with practice I should be able to get it. Thank you very much. Do you need to coat it with some kind of sealer to make it permanent ? All air-dry clays should be sealed to protect against dirt and moisture. I recommend a matte finish. Any of the spray sealers sold for clay or tole painting projects should work. Mary, thank you for your advice. Hello, may I ask which CP you use ? Is it available to purchase ? I have made some at home trying different recipes ,that turn out ok but I want to work with a really good CP . Thanks for the tutorial , they are precious dolls . OH DID YOU USE A ARMITURE FOR THE BODYS ?